Toyo Ito ideally manipulates the invisible power of nature to shape Kaze. The main highlight of the modular bookcase structure is the set of polished-aluminium ogive struts, arranged irregularly as if carried away by a gale-like wind. Furthermore, the randomly-spaced shelves are made of extruded aluminium with walnut veneer. 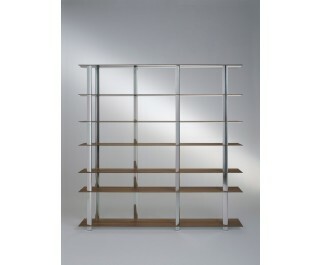 Bookcase with uprights and shelves made from extruded anodized aluminium. The shelves have varying spaces between them and the uprights, with ogival crosssection, are arranged in an irregular and asymmetrical manner. The upper part of the shelves is veneered using walnut. Adjustable feet.